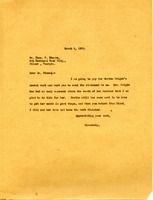 Martha Berry encloses a letter from Mr. Alston and informs Mr. Forbes that Dr. Ray said every dentist in the district was perfectly willing. She says that she does not understand what it is all about, but she has a thousand students that need attending and she would like some action on this. 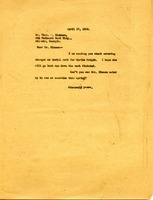 Martha writes to Dr. Hinman that she is going to pay for Martha Wright's dental work and to send the statement to Martha.